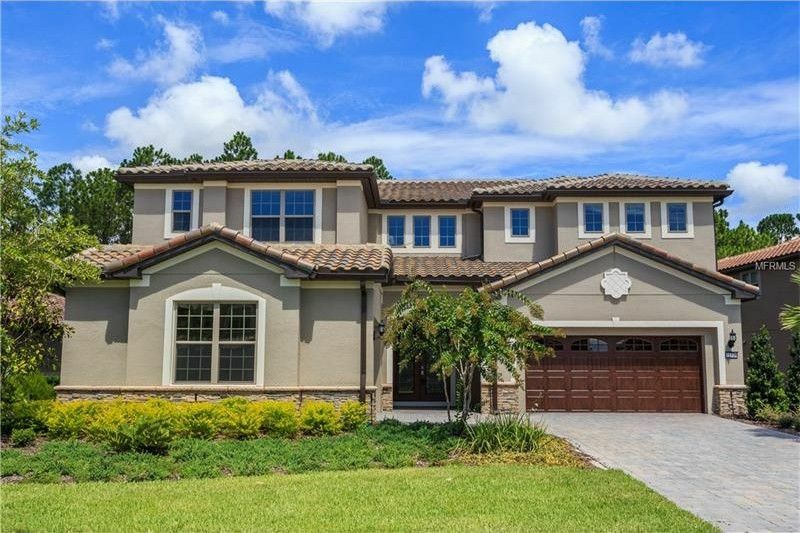 *BRAND NEW GATED/NEVER OCCUPIED POOL HOME* GRACE & SPACE COMBINE IN FORMING AN ASSEMBLAGE OF STYLE & FUNCTION IN THIS ESTATE AT THE ENCLAVE AT VILLAGEWALK. From the moment you open the front entry into the sprawling foyer, you will notice the fine detail, selection, & overt abundance of chosen options that adorn this masterpiece. Downstairs hosts two separate parking-garage entries, an adjacent bedroom #5/office with private bath, and a true Florida rain/mud room with built-in accoutrements. The spiral staircase is a true remarkable focal point, not to mention the height of these ceilings with sky box ocular windows! Activating your linear gas remote fireplace in the spacious great room is as simple as pressing the button, & with currently no rear neighbors & facing a large family of breezy pines, one can enjoy the privacy & freedom of dressing, "or not" for the occasion or after returning from a hot work day. The rear brick lanai deck is screen enclosed and partially covered nearer the rear glass French doors to enjoy just about any kind of weather that may come wayward or not of Savona Way. Venture into the private enclave entry to the Master Bedroom with exceptional views of the rear forest, & note the second SHOE/WINTER/FORMAL closet in addition to the main master closet with personal Washer & Dryer in place. Upstairs offers 3 additional bedrooms, an ensuite laundry Suite, a den-loft that could be bedroom #6 with ease, & lounge/Movie room with kitchen for more intimate get togethers. Driving Directions: 417(GREENEWAY) to NARCOOSEE ROAD EXIT LEFT-NORTH. Left on LK. NONA BLVD, go past ADALINA PLACE on Right to TURN RIGHT AT GATE KIOSK ENTRANCE OF (SAVONA WAY).